Enjoy seven days in New Zealand sampling local wines and culture! A taste of both the North & South Island, this itinerary is sure to please. Arrive Auckland, the ‘City of Sails’, offering all of the things associated with a sophisticated cosmopolitan city, from beautiful scenery to adrenaline pumping adventure - and first-class food and wine. Stay 3 nights in a boutique style downtown hotel surrounded by shops, theatres and restaurants, with Viaduct Harbour, ferry terminals and Vector Arena just a short walk away. This morning enjoy a trip over the Harbour Bridge, followed by an exclusive tour through the Westhaven Marina, home to thousands of yachts and also through Viaduct Harbour. Visit the famous Auckland landmark of Mount Eden, a dormant volcano whose summit offers excellent panoramic views of the city and harbors. In addition to these natural features the city sights tour also takes in the trendy shopping area of Parnell Village with its historical buildings that have been transformed into boutiques, antique, craft and specialty shops. Your tour will then take you along the scenic waterfront route of Tamaki Drive before returning to Downtown. Discover Waiheke Island. Take a picturesque 40-minute boat trip followed by a deluxe vineyard tour which combines world-class wine with the beautiful surroundings of Waiheke Island. On conclusion of the tour, take advantage of the All Day Bus Pass. This allows you to either return to a destination on the tour, or discover the island further on Fullers Waiheke Island scheduled bus services. This morning you will be transferred to the airport for your flight to Queenstown (flight not included). Queenstown is the Southern Hemisphere's premiere four season alpine and lake resort. Nestled on the shores of Lake Wakatipu and overlooked by the majestic Remarkables Range, Queenstown is the perfect destination all year round. Your hotel is conveniently located within walking distance to the center of Queenstown and just a few minutes stroll from the picturesque Lake Wakatipu. Spend an afternoon among the boutique vineyards and superb scenery of the Central Otago Wine Region. 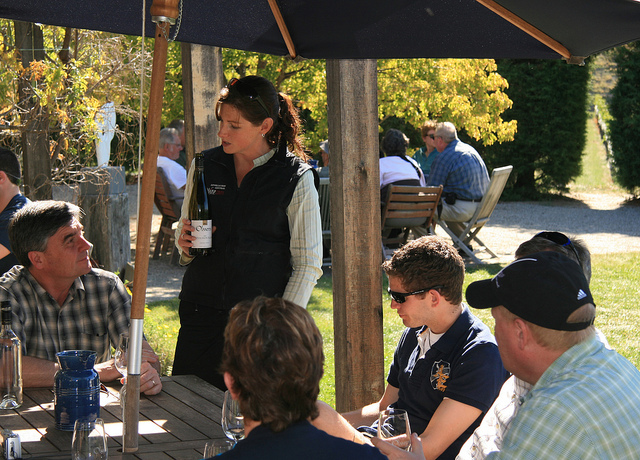 Taste at 4 of the regions vineyards - 2 in the Gibbston Valley and 2 in Bannockburn, enjoy a gourmet platter lunch, bathe in the amazing scenery and learn about the gold history of this diverse region. Just a 5 minute walk from central Queenstown, ride the Skyline Gondola to the top of the Skyline complex at the summit of Mount Ngongotaha. The best views in the region are found here spread out in a spectacular 220 degree panorama, with breathtaking views of Coronet Peak, The Remarkables mountain range and across Lake Wakatipu to Cecil and Walter Peaks. It's truly magnificent and awe-inspiring! Morning at leisure before your transfer to the airport.